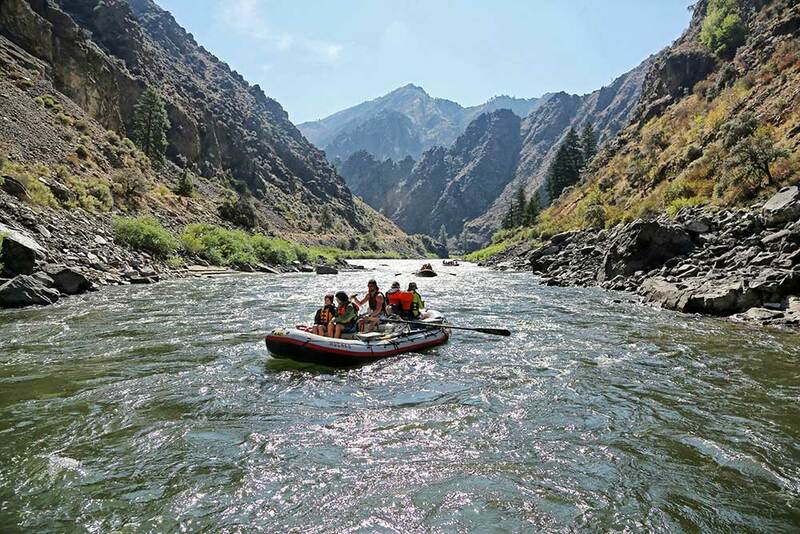 For our Middle Fork of the Salmon rafting trip, we meet in the picturesque mountain town of Stanley, Idaho, the evening before your trip. Depending on water and road conditions, put-in is either Boundary Creek (100 river miles) or Indian Creek Airfield (75 river miles). HRE provides van transportation for trips beginning at Boundary Creek. For other trips we fly to the river with bush pilots the morning of the first day. Cost of these flights, when required, is not included in the price of your trip. We provide van transportation back to Stanley from Cache Bar take-out. Meet at the River 1 at about 7:00 p.m. the evening before the trip. At the meeting, we discuss the trip, check out trip gear, arrange vehicle and luggage storage, and handle any last minute details. River 1 is an outdoor sports and apparel store front located a short walk from the Mountain Village Lodge on Scenic Route 75 in Stanley. While at River 1 you can purchase outdoor clothing and equipment for the river trip at 15% off retail. And, River 1 sells fishing licenses and tackle. 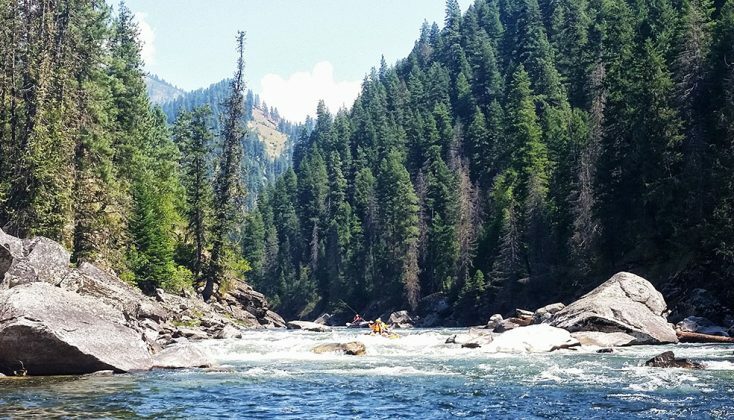 We recommend making reservations at the Mountain Village Lodge or Sawtooth Hotel at the same time you reserve spaces on your river trip. Let them know you are traveling with Hughes River Expeditions. The Mountain Village Lodge provides a lock up room and parking during your trip. A $15/vehicle parking fee is charged. Mountain Village Lodge provides an annual early booking period exclusively for outfitter guests – November 1 to December 31. Beginning January 1st annually, the rooms are booked on a first come/first served basis. When you call the Mountain Village to book a room, let them know that you are on a trip with Hughes River Expeditions, Inc. If you have trouble with room reservations, call our office. We will do our best to help find reservations in Stanley. Stanley, Idaho, can be reached by automobile, daily bus, charter van/bus, and by charter flight. 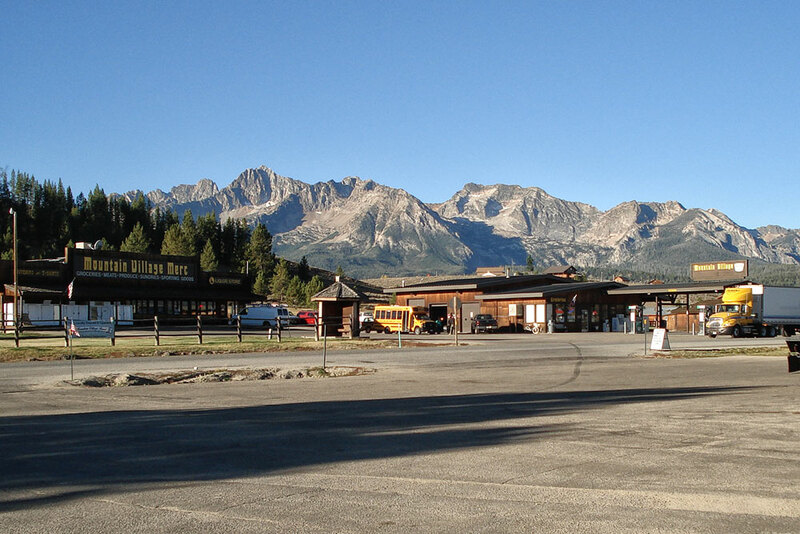 If you are driving, Stanley is located at the junction of Scenic Routes 21 and 75 at the foot of the Sawtooth Mountains. 130 miles from Boise on Highway 21. 60 Miles from Ketchum/Sun Valley on Highway 75. See Travel Details at the end of this document. 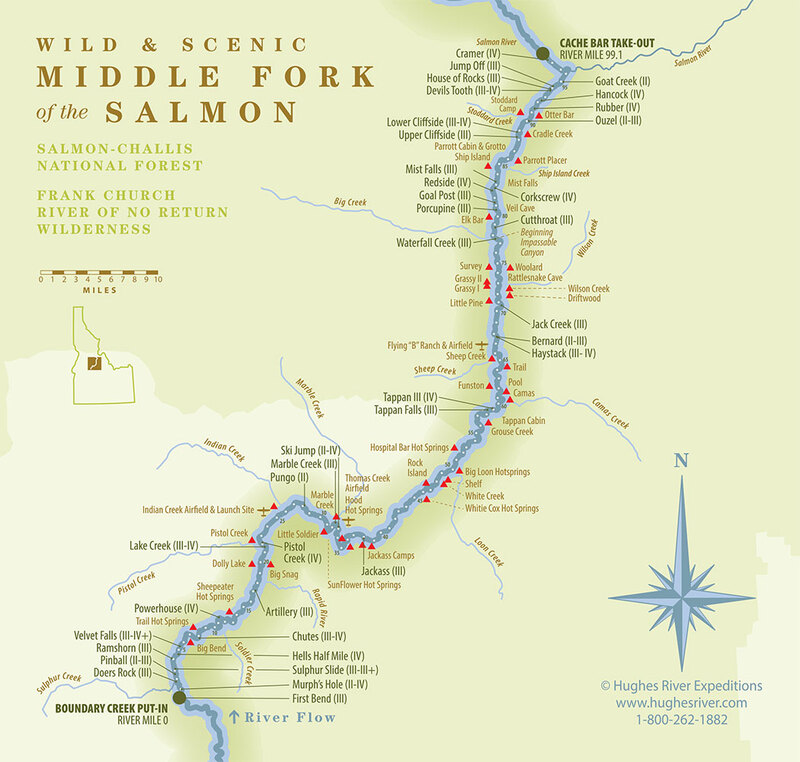 Put‑in for the Middle Fork varies with water, road, and weather conditions. Whenever possible, we put‑in at Boundary Creek. We provide bus transportation from Stanley to the river (43 miles). However, for the safety of the trip, we sometimes put‑in downstream at the Indian Creek or Thomas Airfields. When we fly to the river, the $125/person cost of the flight is not included in the trip price. Plan to pay the pilots at the time of the flight (credit card or cash). We line up the flights. Early June dates may require flights due to road closures or high water conditions. Early and mid-August dates often require flights due to low water flows. Late August & September trips are planned to fly in. Flight cost from Stanley to the river is $125/person when required by road, water, and weather conditions. Early afternoon the last day, we take‑out at Cache Bar on the Main Salmon River, about three miles below the Mouth of the Middle Fork. From take‑out, we provide bus transportation back to Stanley and the Mountain Village Lodge. 190 miles and about 4 ½ hours driving time. Plan to arrive in Stanley about 6:00 p.m.
Return to Stanley and spend the night at the Mountain Village Lodge. We provide bus transportation back to Stanley. 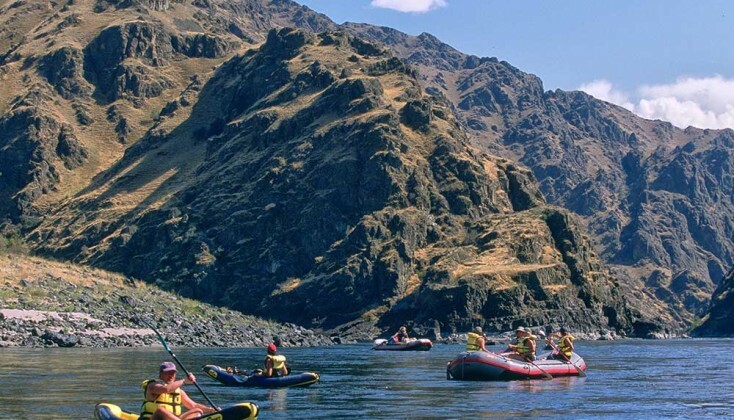 Once in Stanley, use your car, rental car, daily bus, charter van, charter bus, or charter flight to return to Boise or to go to your next destination. Charter a flight from Salmon, Idaho, to Boise, during the afternoon of the last day of your trip. The cost of this flight is approximately $225.00/person. Plan to arrive in Boise at about 5:30 to 6:00 pm. We provide transportation from the Cache Bar take‑out to the Salmon Airport. Mike Dorris, Sawtooth Flying Service, 800-798-6105 or (cell) 208-630-3646. If you wish to drive north into Montana or travel east to the National Parks, you may find it convenient to have your car shuttled to Salmon, Idaho. This service is provided by River Shuttles ‑ 800-831-8942 OR 208‑756-4188 – www.RiverShuttles.com and Caldwell Bus Company, Mike Stephenson – 800-727-9925 (year around office) or 208-774-2265 (summer in Stanley). You can line up this service ahead of time, or when you are in Stanley just before your trip. You can store your vehicle ($15 fee) & luggage at the Mountain Village Lodge. You can also arrange to have luggage transported to meet you in Salmon after the trip if you will fly from Salmon to Boise. We encourage the purchase of Trip Cancellation, Accident, and Baggage Insurance Policies. These policies cover cancellation, personal property, and personal injury. Many insurance companies offer such policies. 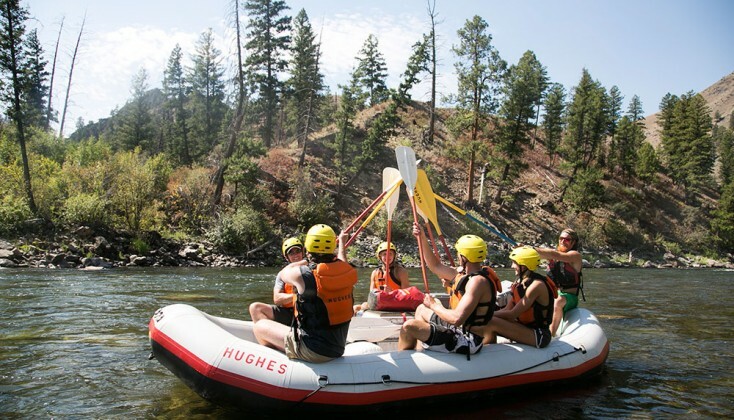 HUGHES RIVER EXPEDITIONS, Inc. spares nothing to assure that all trips we outfit are the safest and best outfitted expeditions available. Our safety record is excellent. However, river running is not without some risk, and you as a potential river runner must be willing to assume this risk. HUGHES RIVER EXPEDITIONS, Inc. assumes no responsibility whatsoever for your personal safety or for damage or loss of your equipment. Available through the Hughes Company Store. 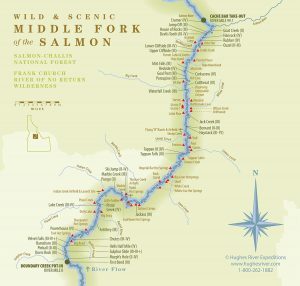 The Middle Fork of the Salmon Map & Guide. Let us know if we can help in any manner. If you are flying commercially, fly into and out of Boise Airport before and after your trip. Drive Your Own Car – Stanley is located at the junction of Scenic Routes 21 and 75 at the foot of the Sawtooth Mountains. 60 miles from Ketchum/Sun Valley on Highway 75. 130 miles from Boise on Highway 21. Rental Car – Weekly car rentals are available at Boise Airport. (Enterprise, National, Budget, Avis, Hertz, Dollar, etc.) There are no drop off opportunities in Stanley during your trip. Sawtooth Transportation – Charter Van transportation between Boise, ID & Stanley, ID. 208.869.2536. shuttles@sawtoothtrans.com. 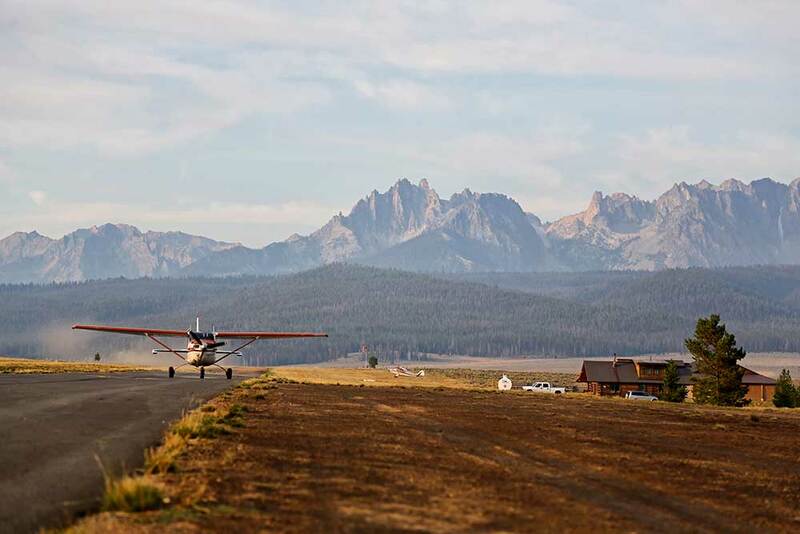 Sawtooth Flying Service – Great views over central Idaho backcountry. Mike Dorris – 800-798-6105 or 208-630-3646. Seats must be booked at least one week in advance, we recommend booking your flights well ahead of your river trip dates. 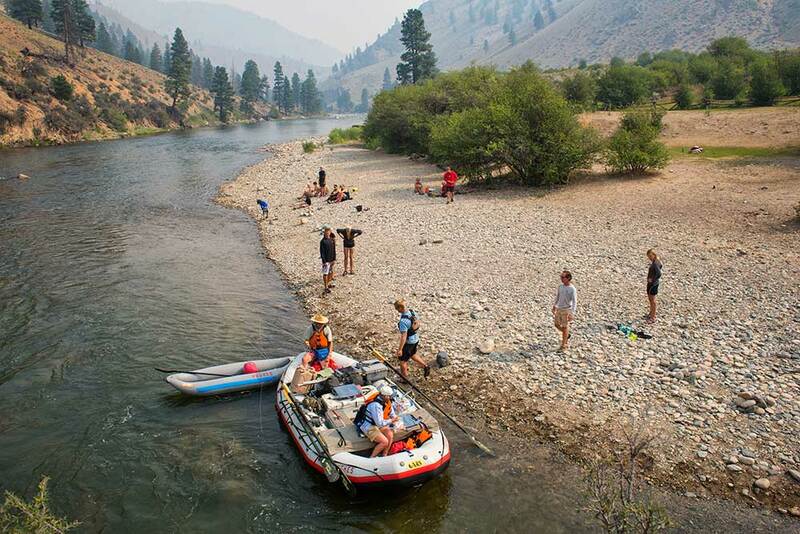 Charter flights are also available from Salmon or Stanley to Sun Valley, Idaho; Jackson Hole, Wyoming; Spokane, Washington; Salt Lake City, Utah; and other locations..
River Shuttles – If you need to have your car shuttled to Salmon, Idaho, at the end of the trip, contact: River Shuttles ‑ 800-831-8942 OR 208‑756-4188 – www.RiverShuttles.com. You can line up this service ahead of time, or when you are in Stanley just before your trip. We’re here to answer any and all of your questions or send us an email. We just completed our sixth trip with Hughes, and it was terrific! I always think I might grow tired of these trips one day, but it hasn’t yet happened. Kim and I will probably be 90 years old and asking for walker accommodations onshore…Thanks again for a great trip! You’re the very best.